Cardiomyopathy is a chronic disease of the heart muscle (myocardium), in which the muscle is abnormally enlarged, thickened, and/or stiffened. The weakened heart muscle loses the ability to pump blood effectively, resulting in irregular heartbeats (arrhythmias) and possibly even heart failure. Cardiomyopathy, a disease of the heart muscle, primarily affects the left ventricle, which is the main pumping chamber of the heart. The disease is often associated with inadequate heart pumping and other heart function abnormalities. Cardiomyopathy is not common (affecting about 50,000 persons in the United States) but it can be severely disabling or fatal. Severe cases may result in heart failure and will require a heart transplant for patient survival. Cardiomyopathy is a heart condition that not only affects middle-aged and elderly persons, but can also affect infants, children, and adolescents. Dilated (congestive cardiomyopathy). This is the most common form of the disease. The heart cavity is enlarged and stretched (cardiac dilation), which results in weak and slow pumping of the blood, which in turn can result in the formation of blood clots. Abnormal heart rhythms (arrhythmias) and disturbances in the electrical conduction processes in the heart may also occur. Most patients with this type of cardiomyopathy develop congestive heart failure. There is also a genetically-linked cardiac disease, Barth syndrome, that can cause dilated cardiomyopathy. This syndrome affects male children, and is usually diagnosed at birth or within the first few months of life. Pregnant women during the last trimester of pregnancy or after childbirth may develop a type of dilated cardiomyopathy referred to as peripartum cardiomyopathy. Hypertrophic cardiomyopathy. With this type of cardiomyopathy, the muscle mass of the left ventricle enlarges, or hypertrophies. In hypertrophic obstructive cardiomyopathy (HOCM), the septum (wall) between the two heart ventricles (the pumping chambers) becomes enlarged and obstructs blood flow from the left ventricle. The thickened wall can also distort one leaflet of the mitral valve, which results in leakage. HOCM is most common in young adults. HOCM is often hereditary, caused by genetic mutations in the affected person's DNA. The disease is either inherited through one parent who is a carrier or through both parents who each contribute a defective gene. HOCM is also referred to as asymmetrical septal hypertrophy (ASH) or idiopathic hypertrophic subaortic stenosis (IHSS). In another form of hypertrophic cardiomyopathy, non-obstructive cardiomyopathy, the enlarged heart muscle does not obstruct the blood flow through the heart. Restrictive cardiomyopathy. This is a less common type of cardiomyopathy, in which the heart muscle of the ventricles becomes rigid. Restrictive cardiomyopathy affects the diastolic function of the heart, that is, it affects the period when the heart is relaxing between contractions. Since the heart cannot relax adequately between contractions, it is harder for the ventricles to fill with blood between heartbeats. This type of cardiomyopathy is usually the result of another disease. 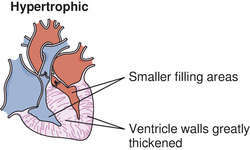 Arrhythmogenic right ventricular cardiomyopathy (ARVC). ARVC is very rare and is believed to be an inherited condition. With ARVC, heart muscle cells become disorganized and damaged and are replaced by fatty tissues. The damage appears to be a result of the body's inability to remove damaged cells. The damaged cells are replaced with fat, leading to abnormal electrical activity (arrhythmias) and abnormal heart contractions. ARVC is the most common cause of sudden death in athletes. Cardiomyopathy may be caused by many different factors, including viral infections (e.g., myocarditis), heart attacks, alcoholism, long-term, severe high blood pressure, genetic neuromuscular diseases (e.g., muscular dystrophies and ataxias), genetic metabolic disorders, complications from AIDS, and other reasons that have not yet been identified (idiopathic cardiomyopathy). Cardiomyopathy caused by heart attacks (referred to as ischemic cardiomyopathy) results from scarring in the heart muscle. Larger scars or more numerous heart attacks increases the risk that ischemic cardiomyopathy will develop. Alcoholic cardiomyopathy usually develops about 10 years after sustained, heavy alcohol consumption. Other toxins that may cause cardiomyopathy include drugs and radiation exposure. A complete physical examination and health history review by a health care provider is recommended if a person is suspected to have cardiomyopathy. The examination may reveal the presence of an irregular heartbeat, heart murmur, or other abnormal heart and breath sounds. Various invasive and non-invasive tests are performed as diagnostic tools for cardiomyopathy. An echocardiogram is the most informative noninvasive test for diagnosing the type of cardiomyopathy and the degree of dysfunction in the heart muscle. High frequency sound waves produce moving images of the beating heart on a video screen, which allows the measurement of muscle thickness, size, pumping ability, degree of obstruction, chamber size, and heart valve movement. The use of non-invasive radiation-based imaging procedures, such as chest radiography, computed tomography (CT), or magnetic resonance imaging (MRI) procedures show the size, shape, and structure of the heart. If dilated cardiomyopathy is suspected, one of these techniques is performed first to see if the heart is enlarged and whether there is any fluid accumulation in the lungs. An electrocardiogram (EKG) is a non-invasive procedure where electrodes are placed on the person's limbs and chest wall to provide a graphic record of the electrical activity of the heart. This test can show the amount of heart enlargement and reveal abnormal heart rhythms. Children with a normal echocardiogram may have an abnormal EKG, indicating that they may be a carrier of the cardiomyopathy gene and may develop the disease later in life. A person may also wear a Holter monitor, which is an external device that continuously records heart rhythms. The monitor can identify irregular heart rhythms associated with dilated, hypertrophic, or restrictive cardiomyopathy. Genetic studies may help in understanding the cause of cardiomyopathy, since the disease may be a symptom of another genetic disorder. If a child under the age of 4 has cardiomyopathy, metabolic screening should be performed, for certain metabolic disorders with cardiomyopathy as a symptom can be controlled with a change in diet, drug therapy, or by a bone marrow transplant, which may reduce or reverse the progression of the cardiomyopathy. Since cardiomyopathy can be inherited and present initially without signs or symptoms, relatives of a patient with the disease should be screened periodically for evidences of the disease. Invasive procedures, which involve the use of anesthesia, are used to determine the severity of the disease. In the radionuclide ventriculogram procedure, a low-dose radioactive material is injected into a vein and flows to the heart. The heart is photographed with a special camera to assess the contraction and filling of the ventricles at rest and with activity. Cardiac catheterization involves insertion of thin, flexible plastic tubes (catheters) into the heart from a blood vessel in the groin area. A dye is then injected that can indicate blood pressures, blood flow within the heart, and blockages in the arteries. Although rarely used, a heart muscle biopsy, where the doctor removes a few, tiny pieces of the heart for laboratory studies, can aid in diagnosing possible infections in the heart or metabolic abnormalities. An electrophysiology study is similar to heart catheterization. Catheters with fine wires are inserted through veins in the groin area into the heart. Electrical stimuli applied through the wires can indicate abnormal conduction pathways, arrhythmias, effectiveness of drugs, and the need for an implanted defibrillator. Although there is a long list of possible causes for cardiomyopathy, few are directly treatable or curable. Therefore, most therapy is directed towards treating the effects of the disease on the heart. If cardiomyopathy is diagnosed at an advanced stage, a critically ill patient will require immediate life-saving measures such as placement of a breathing tube and administration of medicines to improve heart function and blood pressure. Once the patient is stabilized, long-term therapy needs, such as oral medication, pacemakers, surgery, or heart transplantation, will be identified. Initial treatments for cardiomyopathy for patients diagnosed in the earlier stages of cardiomyopathy include drug therapy to relieve heart failure, to decrease oxygen requirements and workload of the heart (by relaxing the arteries in the body), and to regulate abnormal heartbeats. Drugs that help the heart contract include digoxin for at-home use and dopamine, dobutamine, and milrinone for in-hospital use. Diuretics help relieve fluid overloads in heart failure. Vasodilators, ACE-inhibitors, and beta blockers dilate blood vessels in the body and lower blood pressure, thus reducing the workload for the heart. For patients at risk of developing blood clots, anticoagulation medication or blood thinners such as heparin or coumadin are prescribed along with diuretics such as Lasix and aldactone to relieve venous congestion. These drugs may result in side effects, so the patient must be carefully monitored to prevent complications. When drugs are not effective or when arrhythmias require regulation, a pacemaker or a defibrillator may be implanted surgically into the patient. The procedures for implanting both devices involves placing a small mechanical device under the skin of the chest or abdomen with wire leads threaded through veins to the heart. A pacemaker is used to monitor and stabilize slow heartbeats, while a defibrillator ("an emergency room in the heart") detects and treats fast and potentially lethal heart rhythms. Since sudden death may occur in patients with cardiomyopathy, defibrillators are often recommended for persons who show evidence of arrhythmias. For heart failure symptoms associated with restricted blood flow from the ventricles, septal myomectomy, which is considered major heart surgery, is sometimes recommended. This procedure involves surgical removal of the part of the thickened septal muscle that blocks the blood flow. In some cases, the mitral valve is replaced with an artificial valve. However, the procedure does not prevent sudden death due to hear arrhythmias nor does it stop the disease from progressing. Since cardiomyopathy often becomes progressively worse, the heart can reach a state where it no longer responds to medication or to surgery. The treatment of "last resort" is a heart transplant, when the patient exhibits severe heart failure symptoms. A transplant can cure the symptoms of heart failure, but the surgery carries significant risks, such as infection, organ rejection, and side effects of required medications. There are surgical procedures that can be implemented to sustain life until a transplant donor becomes available. Left Ventricular Assist Device (LVAD) provides mechanical circulatory support, while Dynamic Cardiomyoplasty is a procedure whereby a skeletal-muscular flap, created from a patient's chest muscle, is first taught to contract and then is wrapped around the heart to aid in contraction. Alternative treatments are directed towards control of the effects of heart disease. Exercise, diet, nutrition, herbal therapies, stress reduction, and other life style changes (e.g., cessation of smoking) can all be used to complement conventional treatments. Certain herbs such as fox glove (Digitalis purpurea) and lily of the valley (Convallaria majalis) contain cardiac glycosides that make them particularly potent and may cause dangerous side effects. Their use should be supervised only be a qualified medical herbalist, with the concurrence of the primary conventional health care provider. Even the use of less potent herbs that improve cardiac function, such as hawthorn (Crataegus laevigata), should be approved by the conventional health care provider and administered under the supervision of a medical herbalist. Long-term prognosis can be unpredictable, as there can be a wide range of severities and outcomes associated with the disease. There is no cure, but some symptoms and complications can be managed and controlled with medication and implantable devices or with a heart transplant. Prevention of cardiomyopathy is focused on controlling risk factors for heart disease, which includes maintaining a healthy weight, exercising regularly, eating a well-balanced nutritious diet, and avoiding or minimizing smoking. Arrhythmia — An abnormal rhythm or irregularity of the heartbeat. The heartbeat may either be too fast (tachycardia) or too slow (bradicardia). Arrhythmias may cause symptoms such as palpitation or light-headedness, but many have more serious consequences, including sudden death. Hypertrophy — Literally means an increase in the muscle mass (or weight) of the heart. Mitral valve leaflets — The mitral valve is made up of two valve leaflets (the anteromedial leaflet and the posterolateral leaflet) and a ring around the valve, known as the mitral valve annulus. The orientation of the two leaflets resembles a bishop's miter, which is where the valve receives its name. Myocardium — The muscular wall of the heart located between the inner endocardial layer and the outer epicardial layer. Noninvasive — Refers to tests that generally do not invade the integrity of the body, such as echocardiography or electrocardiography. (Cardiac cathetherization, on the other hand, in which catheters are introduced through blood vessels into the heart, is an example of an invasive test). Septum (ventricular septum) — That portion of the heart wall that divides the right and left ventricles. Ventricles — The two main (lower) pumping chambers of the heart; the right and left ventricles pump blood to the lungs and aorta, respectively. Dilated Cardiomyopathy: A Medical Dictionary, Bibliography, and Annotated Research Guide to Internet Resources. San Diego, CA: Icon Health Publications, 2004. Maron, Barry J., and Salberg, Lisa. Hypertrophic Cardiomyopathy: For Patients, Their Families, and Interested Physicians. Malden, MA: Futura Media Services, 2001. Parker, J.M., and Parker, P.M. The Official Patient's Sourcebook on Hypertrophic Cardiomyopathy. San Diego, CA: Icon Health Publications, 2002. Parker, J.M., and Parker, P.M. The Official Patient's Sourcebook on Dilated Cardiomyopathy. San Diego, CA: Icon Health Publications, 2002. Ommen, Steve R., and Nishimura, Rick A. "A Physician's Guide to the Treatment of Hypertrophic Cardiomyopathy." HeartViews 1(10): 393-401. http://www.mayoclinic.org/hypertrophic-cardiomyopathy/physiciansguide.html. American Heart Association, National Center, 7272 Greenville Avenue, Dallas, TX 75231. Telephone: (800) 242-8721; http://www.americanheart.org/. Hypertrophic Cardiomyopathy Association, P.O. Box 306 Hibernia NJ 07842. Telephone: (973) 983-7429; http://www.4hcm.org/. Children's Cardiomyopathy Foundation, P.O. Box 547, Tenafly, New Jersey 07670. Telephone: (201) 227-8852; http://www.childrenscardiomyopathy.org/. Cleveland Clinic Heart Center. 〈http://www.clevelandclinic.org/heartcenter/pub/guide/disease/hcm.asp〉. National Heart, Blood, and Lung Institute, National Institutes of Health, NHLBI Health Information Center, P.O. Box 30105, Bethesda, MD 20824-0105. Telephone: (301) 592 8573; http://www.nhlbi.nih.gov. Disease of the myocardium. As a disease classification, the term is used in several different senses, but is limited by the World Health Organization to: "Primary disease process of heart muscle in absence of a known underlying etiology" when referring to idiopathic cardiomyopathy. 1. a general diagnostic term designating primary noninflammatory disease of the heart. alcoholic cardiomyopathy dilated cardiomyopathy in patients chronically abusing alcohol. beer-drinkers' cardiomyopathy cardiac dilatation and hypertrophy due to excessive beer consumption; in at least some cases it has been due to the addition of cobalt to the beer during the manufacturing process. congestive cardiomyopathy , dilated cardiomyopathy a progressive syndrome of ventricular dilatation, systolic contractile dysfunction, and, often, congestive heart failure, believed due to myocardial damage by factors such as alcohol or infection. hypertrophic cardiomyopathy (HCM) a form marked by ventricular hypertrophy, particularly of the left ventricle, with impaired ventricular filling due to diastolic dysfunction. hypertrophic obstructive cardiomyopathy (HOCM) a form of hypertrophic cardiomyopathy in which the location of the septal hypertrophy causes obstructive interference to left ventricular outflow. infiltrative cardiomyopathy restrictive cardiomyopathy characterized by deposition in the heart tissue of abnormal substances, as may occur in amyloidosis, hemochromatosis, etc. ischemic cardiomyopathy heart failure with left ventricular dilatation resulting from ischemic heart disease. restrictive cardiomyopathy a form in which the ventricular walls are excessively rigid, impeding ventricular filling. right ventricular cardiomyopathy a right-sided cardiomyopathy occurring particularly in young males, with dilatation of the right ventricle with partial to total replacement of its muscle by fibrous or adipose tissue, palpitations, syncope, and sometimes sudden death. A disease or disorder of the heart muscle, especially of unknown or obscure cause. any disease of the myocardium causing enlargement. Also called myocardiopathy. Cardiology A general term for a disease of the heart, defined by WHO as a primary disease process of heart muscle in absence of known underlying etiology. See Alcoholic cardiomyopathy, Beer drinkers cardiomyopathy, Dilated cardiomyopathy, Hypertrophic cardiomyopathy, Idiopathic dilated cardiomyopathy, Ischemic cardiomyopathy, Peripartum cardiomyopathy, Restrictive cardiomyopathy, Secondary cardiomyopathy. Disease of the myocardium; a primary disease of heart muscle in the absence of a known underlying etiology. 1. A disease of heart muscle of unknown cause and classified into thickened (hypertrophic), ballooned (dilated) and unyielding (constrictive) cardiomyopathies. 2. Heart muscle damage from alcohol, vitamin deficiency, infections, athletic activity, anabolic steroids, autoimmune disease and sarcoidosis. The term is also sometimes applied to heart muscle damage from an inadequate coronary blood supply. a group of diseases of the myocardium associated with cardiac dysfunction. It is classified as dilated, hypertrophic or restrictive. Management includes treatment of the cause (if possible) and treatment of heart failure. Heart transplantation is sometimes required. See also hypertrophic obstructive cardiomyopathy (HOCM), sudden death. a general diagnostic term designating primary myocardial disease of unknown cause. a dilated cardiomyopathy, believed to be inherited, is seen in adult Boxers that show syncope, episodic weakness, arrhythmias, and left or biventricular heart failure. a syndrome characterized by cardiac enlargement, especially of the left ventricle, poor myocardial contractility, and congestive heart failure. Occurs most commonly in young to middle-aged dogs of the large and giant breeds with rapidly developing signs of biventricular failure, atrial fibrillation and occasionally systolic murmurs. Cats usually show acute signs of cardiac failure with pleural effusion but not ascites, and sometimes thromboembolism. Called also dilated cardiomyopathy. a distinctive cardiomyopathy is seen in Doberman pinscher dogs, often presenting as an acute pulmonary edema, cardiogenic shock and sometimes sudden death. occurs most commonly in cats, sometimes secondary to hyperthyroidism, occasionally in dogs and rarely in cattle in association with generalized glycogenosis. There is myocardial hypertrophy, primarily in the left ventricle and ventricular septum, resulting in increased resistance to filling and sometimes an outflow obstruction. In cats there is often an associated aortic thromboembolism. myocardial disease secondary to deposition in the heart tissue of abnormal substances such as amyloid or neoplastic infiltration. occurs in calves and probably in the other species. In calves it causes death due to acute heart failure up to the age of 3 months. Recorded in polled Hereford and Japanese black cattle. There may be a brief period of dyspnea and blood-stained frothy nasal discharge before death. Myocardial degeneration is obvious at necropsy. in the subclinical stage, but detectable with echocardiography and ambulatory electrocardiographic recording methods. impaired left ventricular compliance reduces ventricular filling. Uncommon in animals but seen most often in cats, caused by endomyocardial fibrosis or abnormal left ventricular moderator bands. Called also obliterative cardiomyopathy.